Abstract. In situ measurements using unmanned aerial vehicles (UAVs) and remote sensing observations can independently provide dense vertically resolved measurements of atmospheric aerosols, information which is strongly required in climate models. In both cases, inverting the recorded signals to useful information requires assumptions and constraints, and this can make the comparison of the results difficult. Here we compare, for the first time, vertical profiles of the aerosol mass concentration derived from light detection and ranging (lidar) observations and in situ measurements using an optical particle counter on board a UAV during moderate and weak Saharan dust episodes. Agreement between the two measurement methods was within experimental uncertainty for the coarse mode (i.e. particles having radii > 0.5 µm), where the properties of dust particles can be assumed with good accuracy. This result proves that the two techniques can be used interchangeably for determining the vertical profiles of aerosol concentrations, bringing them a step closer towards their systematic exploitation in climate models. New top research facility for weather and climate. The Netherlands Organisation for Scientific Research (NWO) has recently granted the Ruisdael Observatory proposal. The Ruisdael Observatory – named after the 17th-century painter Jacob Ruisdael – will combine a nationwide dense network of measuring points with high-resolution simulations and the necessary computing power in order to map out the changes in local weather, climate and air quality. Read more here. 1. The role of the rainfall input: both in terms of real-time and in the form of numerical forecasts at different spatial and temporal resolutions. 2. The land-use data and associated information such as imperviousness and soil infiltration capacity and how they impact the hydrological response. 3. The flood forecasting model: either in the form of tailored solutions accounting for local surface/sub-surface flows or from a larger-scale perspective (e.g., integrated basin runoff). The goals are to specify the requirements in all these 3 key aspects for different end-user categories, to explore the trade-offs between scale, accuracy and end-user value and assess the limits of current state-of-the-art urban flood forecasting systems. A key aspect of the project is active end-user involvement and multi-disciplinary collaboration between different stakeholders. The main task and responsibility of TU Delft within MUFFIN is to collect high-resolution weather data in Rotterdam to study the spatial organization and dynamics of rainfall over urban areas and perform fundamental research into the science underpinning the measurement and forecasting of heavy localized convective storms. • The Rotterdam X-band rain radar: 1-min horizontal scans with a range of 30 km and a horizontal resolution of 100m are being transmitted in near real-time to a TUD server (from August onwards). • The Micro-rain radar (MRR): A MRR has been purchased and installed on the roof of the CiTG building at TUD. It collects vertical profiles of rain rates, reflectivity, liquid water content and particle size distributions at 10 s and 35 m resolution to study the vertical variability of rain from the clouds down to the ground. • WRF Modelling: the state-of-the art Weather Research and Forecasting software (WRF 3.9) has been set up over Rotterdam and can be used to perform high-resolution numerical weather modelling and forecasting for selected rainfall events. The model has a parent domain of 5 km grid spacing covering the entire BeNeLux region, a second domain of 1 km grid spacing over the Netherlands and a third innermost domain over Rotterdam at 200 m grid spacing and 135 vertical levels. Both single- and double-moment microphysics schemes have been implemented. • Citizen weather data: Rainfall, temperature, wind and pressure from hundreds of citizen rain gauges in and around Rotterdam are being collected since January 2017. 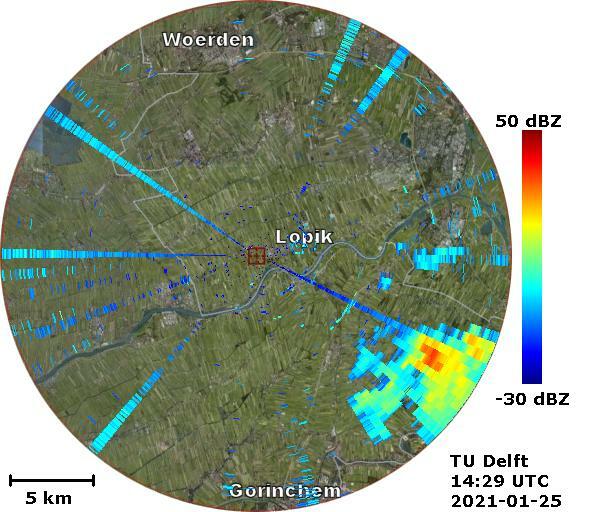 • Professional 5-min weather data (rainfall, temperature, relative humidity and wind) from 10 TU-Delft operated weather stations in/around the city of Rotterdam to validate the radar rainfall products. The 38th AMS Conference on Radar Meteorology held in Chicago, USA, on 27th August – 1st September 2017. Marc Schleiss, Christine Unal and Jiapeng Yin presented this conference. Three oral presentations and two posters from TU Delft ATMOS group were shown during the conference. Marc Schleiss made a presentation titled “Probabilistic Radar Nowcasting Based on Time Nuggets”. Christine Unal made a presentation titled “Raindrop Size Distribution from a Slant Profiling Radar: Assessment Analysis”. Jiapeng Yin made a presentation titled “Object-based Filter Design for Spectral Polarimetric Weather Radar”. In addition, Christine Unal presented a poster named “Estimating Spectral Differential Phase and Spectral Specific Differential Phase to Retrieve Particle Population Separated Ice Water Content Profiles” and Jiapeng Yin presented one named “UAV-Based Absolute Radar Calibration”. The program and short abstracts can be found online @ https://ams.confex.com/ams/38RADAR/meetingapp.cgi/Program/1161. The Geoscience & Remote Sensing (GRS) Department organised a poster session held on May 12th at the CiTG building. The aims of the poster day were to stimulate interaction and collaboration among the GRS staff and students and to promote our department to the wider CiTG. The session was very lively and hosted over 30 posters, from graduate students, teaching and supporting staff, which spanned a wide range of topics. This very successful session sparked the idea of extending it next year by including also other Departments within the TU Delft. Abstract: In this paper, a new clutter suppression method named the moving double spectral linear depolarization ratio (MDsLDR) filter is put forward to mitigate narrow-band clutter in weather radars. The narrow-band clutter observed in the Doppler domain includes: 1) stationary clutter such as ground clutter and 2) non-stationary clutter such as artifacts caused by the radar system itself or external sources. These artifacts are difficult to remove because they are not confined to specific azimuth and range bins. Based on the difference of the spectral-polarization feature and the spectral continuity of precipitation and clutter, MDsLDR filter can remove ground clutter, artifacts and noise. The performance of the newly proposed filter is assessed by data collected by the Doppler-polarimetric IRCTR Drizzle Radar (IDRA). Three precipitation cases are considered in this paper: moderate/light precipitation, convective precipitation with hook-echo signature and light precipitation with severe artifact contamination. Furthermore, the implementation of the MDsDLR filter requires relatively low computation complexity, so that the MDsLDR filter can be operated in real time. The full text of the paper from Jiapeng Yin et. al., 2017, can be found here on the IEEE Xplore webpage. The EGU general assembly in Vienna, 8-13 April 2017 is a Conference for all scientist interested in geophysical topics. Over 14000 people attended this conference, coming from all over the world. Off-course, the ATMOS group and the GRS department were also represented. Scroll trough the GRS tweets, #EGU17 ! Following the past symposia in Lille, France in 2007 and in New Orleans in 2010, the 3rd NASA A-Train symposium was held on 19-21 April in Pasadena (California, USA). The NASA A-Train is a unique afternoon constellation including a high value series of instruments (Aqua (2002), Aura (2004), PARASOL (2004), CALIPSO (2006), CloudSat (2006), GCOM-W1 (2012) and OCO-2 (2014)) observing our atmosphere. Many exchanges allow me to think further about 1) the difficulties, even for LIDAR space-borne sensors, to entirely probe smoke aerosol layers, 2) the possibility to inter-compare OMI and OCO-2 aerosol layer height products in the future. A lot of talks and posters were focused on their contributions to our aerosol and cloud cycle knowledge, and the forthcoming new generation of satellite instruments such as 3MI on MetOp-SG and the new LIDAR EarthCare. Discussions were also held on the recently launched Chinese mission TANSAT, devoted to CO2 observation, which plans to join the constellation soon. With the American mission OCO-2, there will be 2 satellite missions focusing on the atmospheric carbon cycle! Finally, it is worth noting the very interesting & inspiring discussion led by Dr. Bruce Wieliecki on the economic value of climate science. Obviously, this is a burning and still very open topic. And it is hard to reach a consensus in our community. But if we want to convince the society with business key words, the (huge!) return of investment of a new climate observing system should then be more quantitatively emphasized to initiate concrete actions. Great thanks to all the organizers of this symposium (in particular to Liz Juvera) and to all the instrument PIs of the A-Train constellation! The entrance of the Pasadena convention centre, with the banner of the symposium. Front slide of Julien Chimot talk at the 3rd NASA A-Train symposium, Pasadena (California, USA), 2017.04.20. The 11th European Conference on Antennas and Propagation, held in Paris, France, on 19-24 March 2017. Jiapeng Yin, the Ph.D. student in the Atmospheric Remote Sensing Group of the GRS department, made a presentation titled “Spectral Polarimetric Features Analysis of Wind Turbine Clutter in Weather Radar”. This paper was selected to be a finalist for a best paper award, and the finalist papers were requested to present their work in a work in a special poster session dedicated to the Awards. This session took place on Thursday afternoon, March 23, 2017, and gave a possibility for many additional discussions and contacts. Unfortunately, we did not receive the Award. The increasing size and quantity of wind turbines worldwide provide an environmental-friendly solution to fulfill the growing demand for energy. However, this also brings in a new dynamic clutter named wind turbine clutter (WTC) for weather radars, and it has gradually become a concern because WTC deteriorates the radar performance severely. In this paper, Jiapeng mainly introduced the advanced waveform measurements of WTC using the TUD PARSAX radar. Furthermore, the micro-Doppler signature and the spectral-polarimetric properties of WTC were studied. Finally, a WTC mitigation method was put forward. Additionally, colleagues from the Microwave Sensing, Signals and Systems Group of EWI, Alexander Yarovoy, Oleg Krasnov, Stefano Medagli, and Sharef Neemat also presented at this meeting. Abstract: Interaction of the ice crystals with super-cooled liquid droplets in mixed-phase clouds leads to an enhanced growth of the ice particles. However, such processes are still not clearly understood although they are important processes for precipitation formation in mid-latitudes. To better understand how ice particles grow within such clouds, changes of microphysical parameters of a particle population falling through the cloud have to be analyzed. The Transportable Atmospheric Radar (TARA) can retrieve the full 3-D Doppler velocity vector based on a unique three-beam configuration. Using the derived wind information, a new fall streak retrieval technique is proposed so that microphysical changes along those streaks can be studied. The method is based on Doppler measurements only. The shown examples measured during the ACCEPT campaign (Analysis of the Composition of Clouds with Extended Polarization Techniques) demonstrate that the retrieval is able to capture the fall streaks within different cloud systems. These fall streaks can be used to study changes in a single particle population from its generation (at cloud top) till its disintegration. In this study fall streaks are analyzed using radar moments or Doppler spectra. Synergetic measurements with other instruments during ACCEPT allow the detection of liquid layers within the clouds. The estimated microphysical information is used here to get a better understanding of the influence of super-cooled liquid layers on ice crystal growth. This technique offers a new perspective for cloud microphysical studies. The two TU Delft radar IDRA (on top of the tower) and TARA at the Cabauw Experimental Site for Atmospheric Research.